The Department of Community Medicine and Health Care is a basic science department within the UConn School of Medicine. It consists of 23 faculty and over 25 support staff, with a research portfolio representing a total commitment of over $10 million in extramural funding. We serve the School of Medicine as the academic home of faculty in the social, behavioral, and public health sciences as well as health law and medical ethics. The Department of Community Medicine is also home to the Program in Applied Public Health Sciences which offers M.P.H. and Ph.D. degrees as well as four graduate certificates. 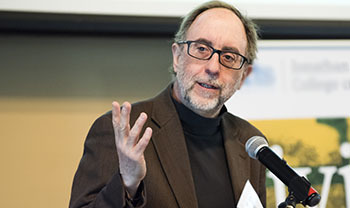 Professor Doug Brugge from Tufts University has been named as the next chair of the Department of Community Medicine and Health Care. 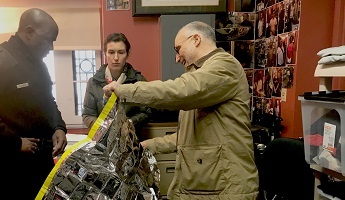 In February, Barbara Case and Vonnie Pawlukiewicz delivered 123 emergency sleeping bags to HPD Officer Jimmy Barrett of the City of Hartford for use by the homeless on behalf of the Department of Community Medicine and the Public Health Student Organization. Along with the sleeping bags, much-needed blankets and hoodies were delivered. 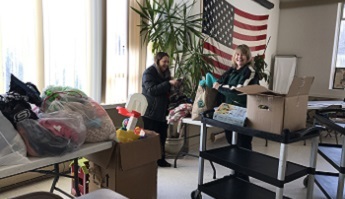 Clothes and toys also were delivered by Barbara Case and Robin Odell to the Open Door Soup Kitchen in Winsted, CT. Thanks to all the donations and the great collaboration by students, staff and faculty! 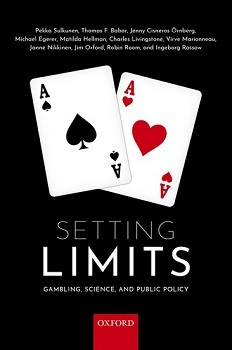 Interview with Professor Babor, co-author of the new international book, Setting Limits: Gambling, Science and Public Policy, sharing scientific, evidence-based recommendations to help policymakers stop the world’s growing gambling epidemic, including the rise in online gambling. April 16 is designated National Health Care Decisions Day to raise awareness of the importance of advance-care planning. A state booklet provides information including the tools needed to create forms. Summer 2019 MPH Course Offerings announced. Fall 2019 MPH Course Offerings announced. Check out our latest newsletter, Public Health Happenings, from the Program in Applied Public Health Sciences! Announcing a new assistant professor faculty member. Dr. Greg Rhee holds a Ph.D. in Social and Administrative Pharmacy from The University of Minnesota and an MSW from the University of Chicago. His health sciences research area interests are in geriatric pharmacotherapy, geriatric social psychiatry and pharmacoepidemiology. Dr. Rhee comes to us from a post-doctoral fellow position in Geriatrics at Yale University School of Medicine. Welcome! Congratulations to Jennifer Cavallari on her promotion to Associate Professor. In May, Dr. Cavallari received the Irving J. Seilkoff-Matthew Shafner Professional Excellence Award from the Connecticut Coalition for Occupational Safety and Health. This award recognizes individuals for professional excellence, dedication and integrity for improving worker health. Also in 2018, she was appointed as Chairman of the Environmental Protection Agency's Human Subject Review Board. Professor Judy Lewis was recognized at this year’s APHA Annual Meeting as the recipient of The Carl Taylor Lifetime Achievement Award in International Health for her visionary leadership in shaping the direction of International Health within APHA. Her nomination for the award acknowledged her lifetime dedication to advancing global maternal and child health “through respectful, long-term interdisciplinary partnerships that address local (and locally identified) community health issues and priorities.” We are inspired by Professor Lewis’ many accomplishments. In Haiti, alone, she has worked with more than 50 students on projects to improve health care delivery and health outcomes. She was founder and current Chair of the Women, Children and Adolescent Workgroup of the World Federation of Public Health Associations and helped create The Network: Toward Unity for Health; Women and Health Together for the Future (WHTF). Congratulations!